These valentines are so cute I want to make them to give out to my friends! I think it is the googley eyes that get me! And that big robot heart. And the candy bar hidden inside, that doesn't hurt. I pretty much love everything about these cute robot valentines. 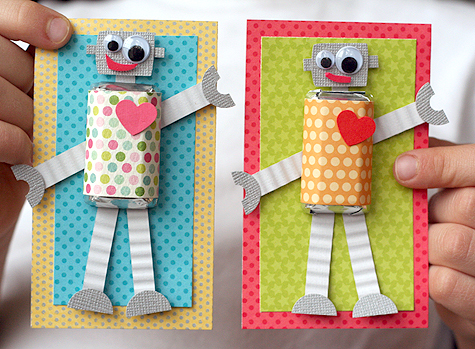 You can check out how to make these super cute robot valentine cards for kids over at Lisa Storms blog.